With the weather in the lead up to the ride being decidedly iffy, ok wet, very wet, a hasty route amendment was brought into effect after a last recce by new road captain Mick Newstead and myself on the Saturday found that the intended back roads were literally under water - up to a foot of the wet stuff! But we didn’t worry and after a sticky start with some heavy traffic in Wandsworth the boys ‘n’ girls got out of town via the A3 and towards the biking mecca of Boxhill. It’s only really once you’re south of Boxhill that the roads open up, off the A24 at Beare Green and towards Capel through the twisties of the A29. All too soon we arrived at the tea/coffee stop, The Parrot at Forest Green where we are always welcome. 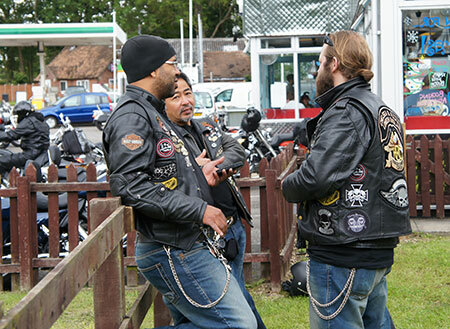 A relaxed break of 40 minutes where we sent the smaller fuel capacity Harley’s off ten minutes earlier with a couple of road captains to a petrol stop a few miles along in Cranleigh. Soon enough we swept past that fuel stop and the Sporties were waved in at the back. Onwards from Cranleigh to Bramley, Godalming, a swift couple of miles followed back down the A3 then off on the A286 for some more twisty stuff through to Haslemere. Turn right towards Liphook and more twisty bits (getting the theme yet?) past Old Thorns Golf Club then another couple of miles down the A3 before hanging another right onto the B3006 for Selbourne and a slow section through the village, that’s ok, time for a pose - smile please! Onto the A339, a seriously curvy road and dry enough to enjoy with around fifty H-D’s snaking back as far as the eye could see. 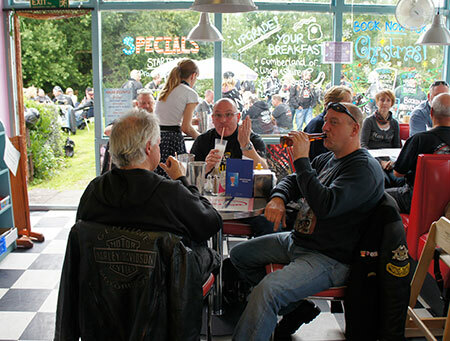 Arrival at Nelson’s Diner just the other side of Basingstoke was almost minute perfect and so we created a second lunch rush and no doubt one happy diner owner! Oh yes they want pictures of the good looking bunch that C&F stands for and of course we’ll happily oblige. My thanks go to the road captains that attended the various recces and went ahead at the Wandsworth one way system to create a decent trail to follow, Les (back marker), Mick (spare at the back), Scottie, Cap ‘n’ Beaky and Colin.